Our Mobile Rock Climbing Wall (portable trailer based Rock Climbing Tower and Abseiling Wall) is suitable for many events. 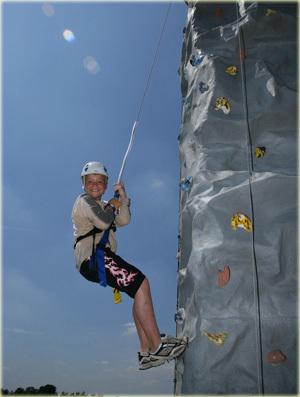 Whether you are looking for a crowd puller for your a large fun day event, a team building activity for your organisation, or an activity outside the classroom for your school, our Mobile Rock Climbing Tower could be just what you are looking for. Sport England describes rock climbing as one of the greatest challenges of human strength, skill and endurance and one of the most rewarding sporting activities. Our Mobile Rock Climbing Wall is an all ability Climbing Wall, providing routes for both experienced climbers, and those with little or no rock climbing experience. Our Mobile Rock Climbing Wall has grit and granite handholds to offer the most realistic experience of rock climbing on a Mobile Rock Climbing Tower. 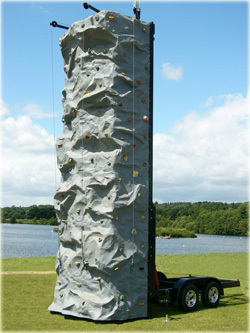 The Mobile Rock Climbing Wall can be used by four rock climbers at one time. It uses hydraulic autobelays to safely control the descent of the climber and is an impressive 8m in height, so it certainly has the wow factor! The Mobile Climbing Wall can be set up on a firm surface (grass or concrete) and can be ready in minutes as it arrives on a portable trailer. The Mobile Rock Climbing Wall is run by fully trained members of our team to ensure safe use of the Rock Climbing Wall. Our team members have Enhanced CRB Disclosures and a First Aid trained team member will attend your event with our portable rock climbing tower. Petzl helmets and safety harnesses are worn by all rock climbers and these are included in our price. Our Mobile Rock Climbing Wall is a 8m high (24ft) tower which allows climbers to enjoy the fun experience and excitement of an extreme sport such as rock climbing at a venue of your choice. To find out more information about our Mobile Climbing Service and our Mobile Rock Climbing Wall, go to why choose our rock climbing wall page. We can deploy any piece of our equipment such as the Portable Rock Climbing Tower at only a days notice providing the activity is still available for hire. We do recommend booking the equipment with plenty of notice to avoid disappointment, especially during the summer months and weekends.